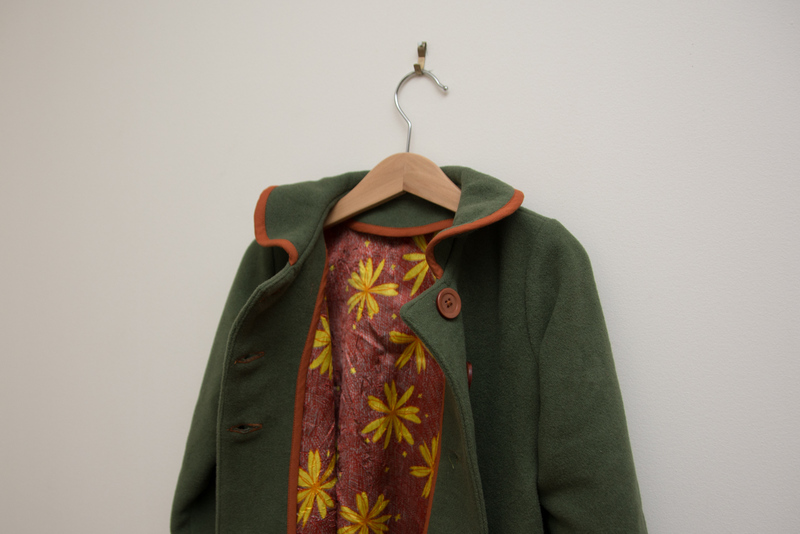 Bartacks and Singletrack: Neat and Lovely Girl's Clothes - coat "y"
Neat and Lovely Girl's Clothes - coat "y"
I have a tendency to buy patterns and let them cellar for a while, but with this book I was straight in, first with my jacket, and now a coat. 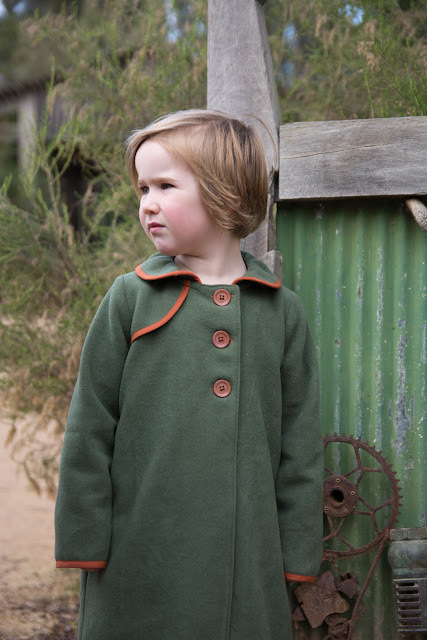 This is coat "y" which is shown in the book in a gorgeous pink/brown colour combination. 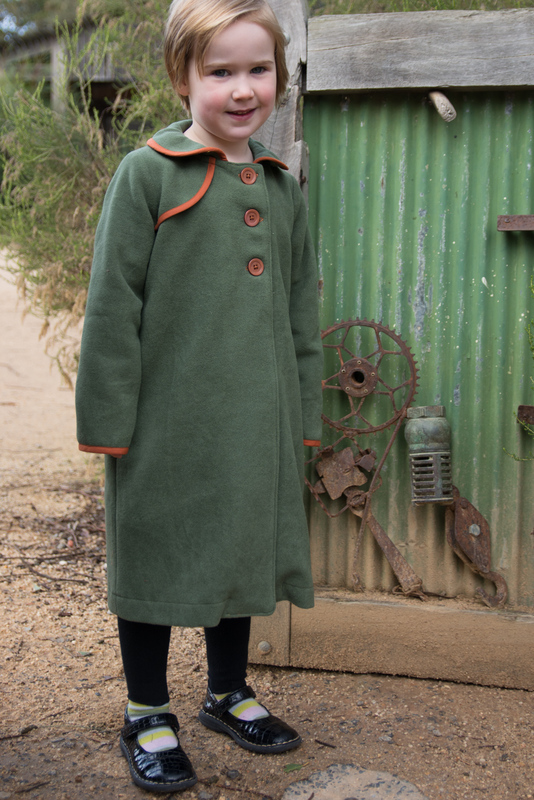 I had bought this lovely, soft wool coating from The Fabric Store back when A was a tiny baby with the intention of it being for her first coat. In my memory it was a much paler, greyer green and I was considering pairing it with pink trim, but in digging it out of the stash I found my memory lacking. It's a perfect autumn green and needed a nice strong, autumn colour for the trim. It might look like she has no hands, but she does! These are some generously long sleeves and since she's the child in the house with normal length arms they seem pretty long on her. In fact, as she moves and runs around the sleeves are actually just right. Nicely long, but not dangly or in the way. I slipped up slightly in my copying of the Japanese characters and ended up interfacing the upper collar not the under collar, so that also doesn't roll quite as nicely as it should. I see these things, and I'm happy to notice them, as if this was my coat I need to have got them right. But hey, it's a 4 year old's coat. I'm not beating myself up over it! I couldn't quite work out what the pattern was suggesting finishing the cuffs and collar with. It looked like ribbon in that there was no folded under edge. However, with the curves of the shoulder flap and collar I figured it would have to be bias cut. I've never seen or heard of bias ribbon, so I just made my own bias binding. The size is 110 which correlated pretty closely to her measurements. It's a perfect fit in the shoulders and body and I couldn't have gone any smaller. These are really nice, tailored fitting patterns. Hopefully she'll grow up and longer limbed without getting too much wider and it will fit well next year as well. The pattern doesn't include any lining but a wool coat needs to be lined, right?! I went with the easy method of just constructing an identical front/back/sleeves out of lining fabric. and basting it all together before attaching the collar and facing. Attaching the facing to the lining is neater, but requires some thought in cutting the front lining pieces and I was feeling a bit lazy. Also this very cheap, synthetic fabric ($2 bin at Spotlight) was horrid to sew, so I was glad I kept it simple. 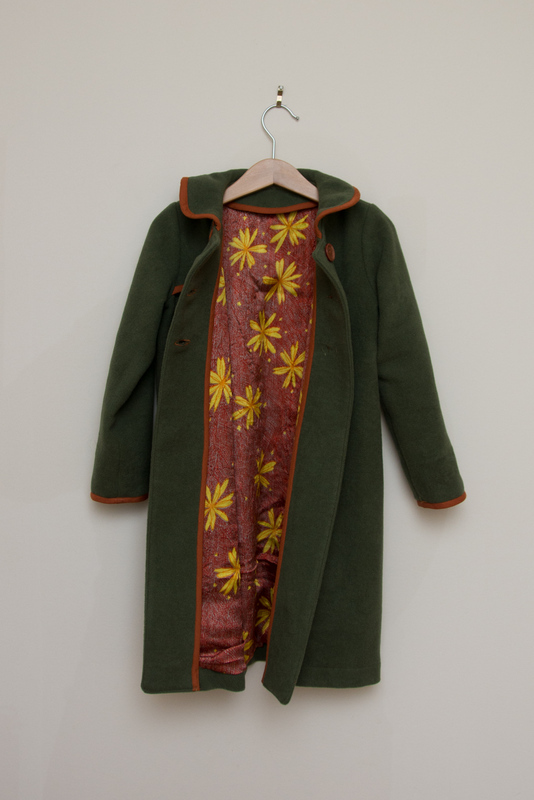 But I had guessed right, she loves those flowers and wants another coat just like this one but with the flowers on the outside. Um, sorry darling, but no. I think I shall have to "lose" the remnants of that fabric. She was very impressed that she didn't have to hold her sleeves when she put the coat on as the slippery arms don't make her sleeves go up. Clever mum hey?! Just don't tell her that people have used slippery linings for centuries, she thinks it's all my idea. I wish I could play you the soundtrack to this photo shoot. 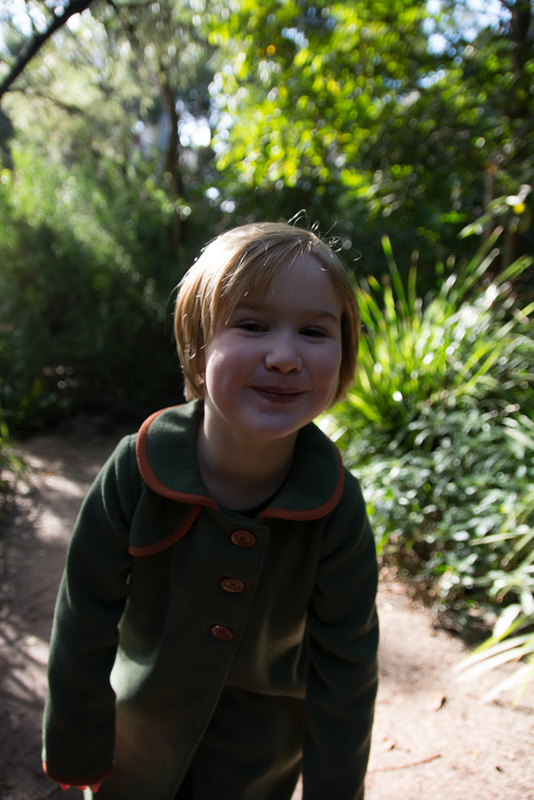 We were at the zoo which is pretty much in the heart of the city, but there was no human noise at all, just the call of bellbirds all around. 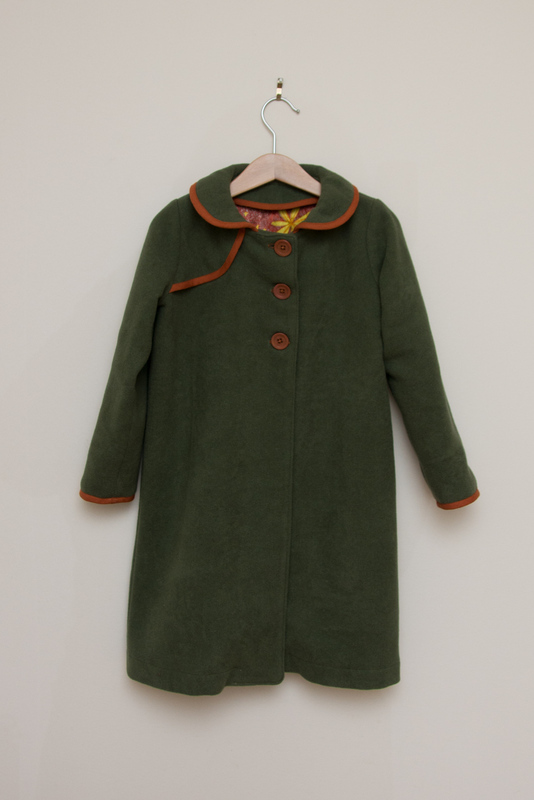 A gorgeous coat, and a welcome relief from puffy jackets and garish colours. It is good to be able to sew! Thank you! I see you have a son with loooong arms too, so yep, it's a great thing we can sew! High five at you! What a beautiful autumnal colour. Annoying about the wool stretching, but you've done a beautiful job sewing this one and I'm sure it'll get a lot of wear. (sorry if this message comes up twice - I tried to comment earlier but it didn't seem to register). Thanks Marisa. I hadn't expected the hanging issue as I was treating it like a Melton coating type of wool and it's obviously less rigid than that. It does feel lovely, almost like a wool fleece. I'm happy to say we've left the "everything must be pink or purple" age, so a coat like this is happily accepted. Yay! Best thing about being a mum is being able to impress my naive little charges! Slippery lining is your mum's idea, sweet A. promise ;) I think it is a 4 y.o. thing to ask for something in the same fabric if they like it. The coat looks great, despite the challenges you have had with it. The fabrics team up beautifully. I actually don't mind longer sleeves on coats, especially for children. Little buggers grow so quickly, the last think I want is their hands hanging out in the cold air up to their wrists! Just the thought of it makes me feel cold. 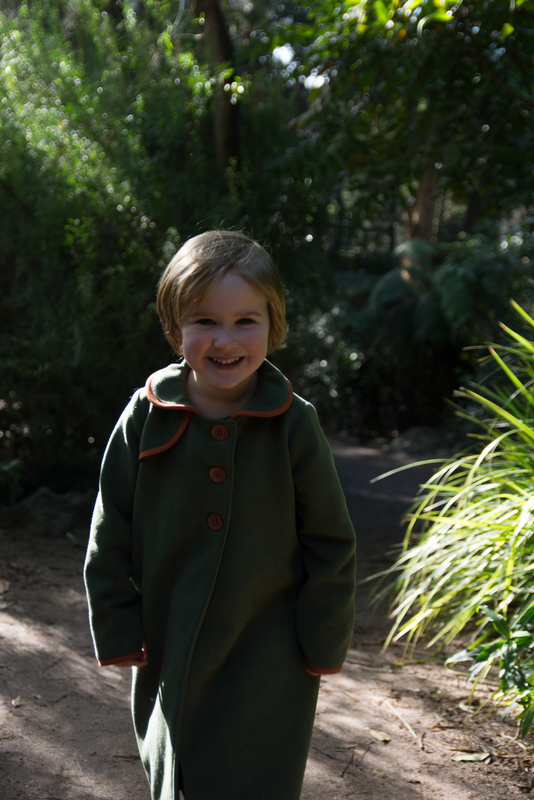 I intentionally made the sleeves on my daughter's coat a tiny little bit longer (just forgot to mention about it hehe). Oh I agree, there's nothing worse than "bracelet length" sleeves. I thought about adding side seam pockets, but the long sleeves make up for the lack of pockets! Isn't it fun when they think you're awesome for the oddest of reasons. Such a great coat! I need to get brave enough to try some wool one of these days. Although with Seattle weather my efforts would be better spent on someone lighter and waterproof. But this post does make me excited for fall sewing, even though we're just heading into summer here. Hope this coat sees a couple seasons for good wear! Thanks Elizabeth. I love sewing with wool. I find the wool jerseys that I use for winter long sleeved T-shirts are so nice to sew and wool coating is just so well behaved. really there's nothing tricky about it. What you probably need more is cotton laminate or raincoat fabric and I have the horrors of sewing that stuff! it's an awesome coat and it'll last her a couple years, which is great! love how you did the lining and bound facings. smart. Thanks Kristin, I hope it lasts. 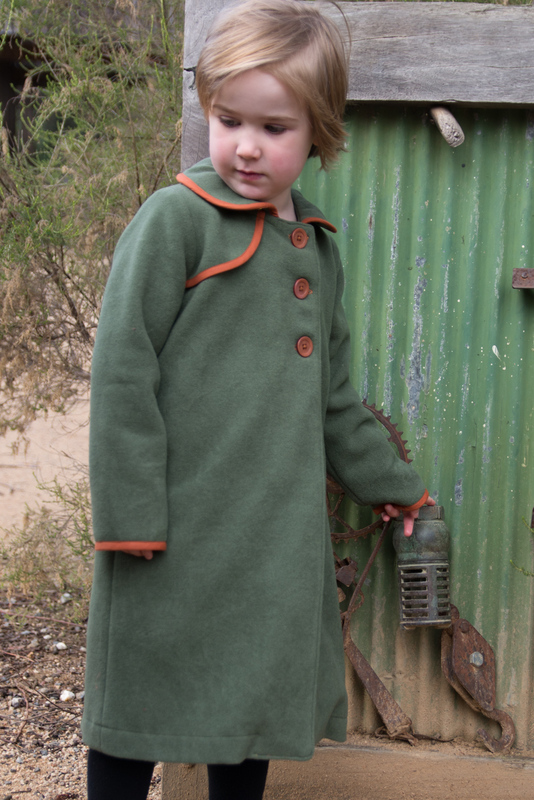 Although I'll probably want to sew another coat next year anyway! Lovely coat and your daughter looks very pleased with it. Great idea for the lining and agree only bias would work on those curves. Love the sounds of Bellbirds, on one of our regular roadtrips, the area was full of Bellbirds and we would all wind down the windows and listen. I should email the lovely Japanese Sewing Books blog and find out what this mystery curvy trim was meant to be! Tis tricky sewing in a foreign language sometimes. Kid's Clothes Week: Pyjama fest! 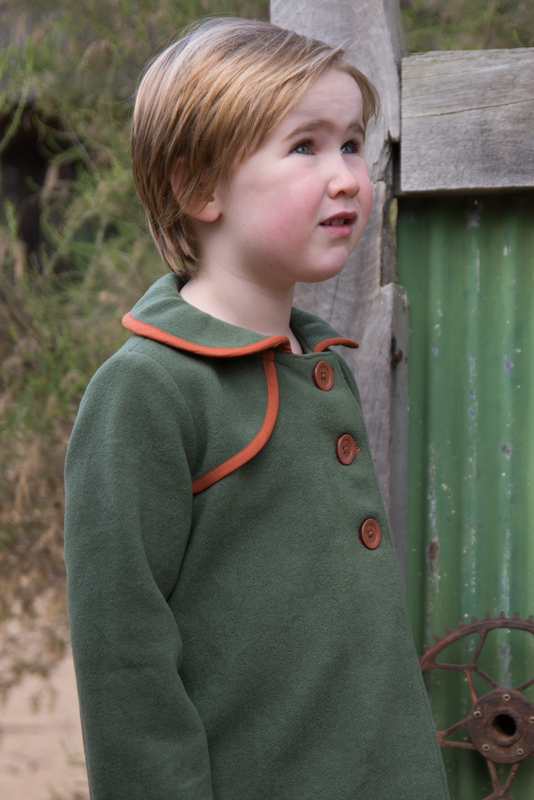 Birthday wishes: "Yoda, the green one, mum"
V neck tutorial tested on me and the kids!